"All we can do is roll with the punches…" First Run Features has unveiled a trailer for a documentary titled Quest, described as a "portrait of an American family" filmed over the course of almost a decade. This "epic in scope" doc follows a couple in North Philadelphia - Christopher "Quest" Rainey, and his wife, Christine'a "Ma Quest" Rainey - as they raise a family in a poverty stricken neighborhood. This premiered at Sundance and has played at tons of festivals all year, picking up numerous awards including Human Rights awards, Jury Prizes, Audience Awards. Not to be confused with the feature film also titled Quest, about the graffiti-loving youngster, this one is a doc and is much different. I've been hearing great things about this and the trailer looks incredible, with footage that will tug at your emotions and definitely make you want to see this. 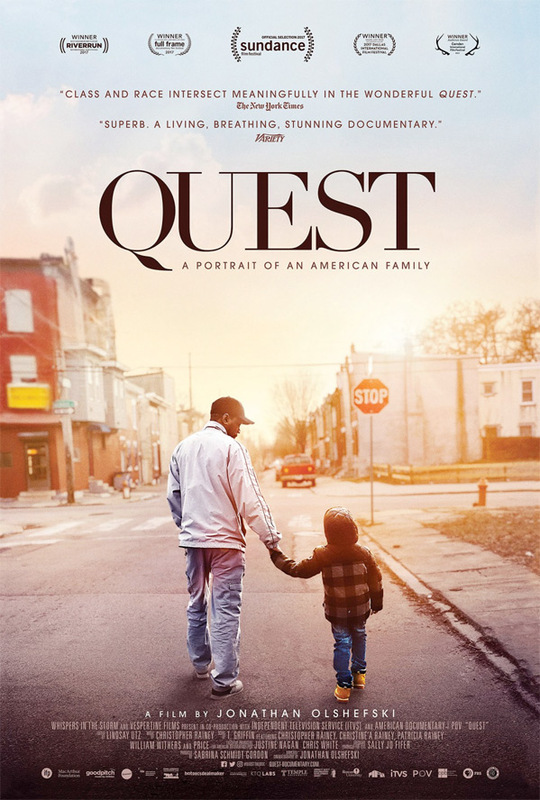 Filmed with vérité intimacy for nearly a decade, Quest is the moving portrait of the Rainey family living in North Philadelphia. Beginning at the dawn of the Obama presidency, Christopher "Quest" Rainey, and his wife, Christine'a "Ma Quest" raise a family while nurturing a community of hip hop artists in their home music studio. It's a safe space where all are welcome, but this creative sanctuary can't always shield them from the strife that grips their neighborhood. Epic in scope, Quest is a vivid illumination of race and class in America, and a testament to love, healing and hope. Quest is directed by filmmaker Jonathan Olshefski, making his directorial debut with this film. This first premiered at the Sundance Film Festival, and also played at numerous other fests including Full Frame, Hot Docs, Sheffield Doc/Fest, Zurich, Denver and more. First Run will release Olshefski's Quest in select theaters (in Philadelphia to start) on December 1st, continuing to NYC on December 8th, and Los Angeles on December 15th. Who's interested in this doc?